High-quality and excellent craftsmanship money banks, trinkets and snow globes with vintage flair. Gorgeous colors, eye-catching items to make any occasion gifts a fantastic surprise. Antique and vintage novelty, movie characters themes, all animals/flowers shaped pieces from around the world provide exceptional choices for your pick. Glass, lucite, bakelite, crystal and porcelain material for all gifting displays. From encouragement to save using a vintage piggy or money bank to desk snowglobe decor or mesmerizing trinket to store your treasures this section can help you find that delightful gift for any ages. Vintage BOSTON Red Sox collectible money piggy bank in chalk plaster green color design, "injured". vintage Nutcracker soldier tall trinket treasure storage jewelry box in colorful porcelain finish. 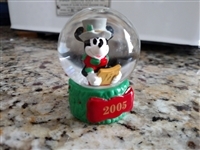 Mickey Mouse, 2005, miniature snow globe. Vintage Clogs Money Bank, Holland. Hand painted decorative trinket storage box, ceramic. White shimmering Castle pen holder with slim design pen decorative stand. Vintage Snow Globe, TX map decoration. Hunkydory tin money bank by Jane Hissey 1991. German vintage tin money bank, Deutsche Bundespost Nachste Lerung, post office box money bank with rubber cork. Vintage glass snow globe bottle shaped with skiers in the snow. 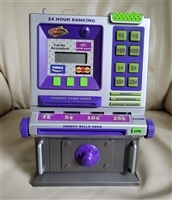 24 Hour Banking money bank from Summit, 2004. Vintage glass paperweight in seashell design with reef, fish bobble inclusion decor. Sasquatch Snow globe Washington State. Vintage paper mache storage box South American with painted girl. Moonshine jug ceramic Mississippi Money Bank. Porcelain COW trinket box for your secret storage, black and white Betsy. Vintage Valentine Serenades wind up porcelain music box playing Love me tender song Heritage House 1992. Walt Disney World Cuties Snowdome Snow globe, 2009. Vintage glass Snoopy dog money bank. Hershey's rubber Chocolate Taxi Money Bank. Large Santa and small sleeping bear porcelain trinket boxes. Vintage wooden Nesting Dog storage box, trinket. Vintage Snow Globe, Lava globe pen holder from Lompoc with beach scenery and windsurfing. Bumble Bee teapot and an Apple floral trinkets set for treasure storage. Musical Carousel Ornament from Holiday Faire in original box, works. 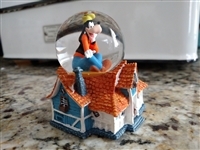 GOOFY snow globe from Disney, retired rare find. 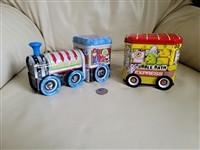 Flocked bunny money bank and toy vintage set of two. Colorful Atlanta, Ga snow globe display. Peach state. Disney Mighty Ducks Piggy/Money Bank in colorful vinyl finish, large, 1990s.